It is easy to get to Nice, it also is easy to get around town. From its airport, located a few kilometres away from the city centre, to its complete intermodal transportation network (road network, high speed rail, bus, tram, taxicab, or vélo bleu rented bike), Nice combines attractiveness and connectivity. Useful information: the airport Nice Côte d'Azur (the 1st in France outside Paris) is just under 15 minutes away from the city centre and offers direct flights to 100 destinations in over 30 countries. The Acropolis Convention centre is located 7 km away from the airport; where you will also find over 30 hotels dedicated to business meetings, seminars, incentive- togethers right in the heart of the city. - From the Airport (Terminal 1 and 2) to Downtown (Art Walk) by the Promenade des Anglais. Departures Terminal 2 every day, every 16 minutes between between 5.40am and 11.45pm. - From City Center (Lycée Massena) to the Airport (Terminals 1 and 2) by the Promenade des Anglais. 2 terminals for departures daily, every 16 minutes, from 5:00 am to 9:00pm. - From the Airport (Terminal 1 and 2) to Downtown (Gare SNCF / Nice-Ville) by the promenade and the Boulevard Gambetta. Departures Terminal 2 every day, every 30 minutes between 7:53am and 8:53pm. 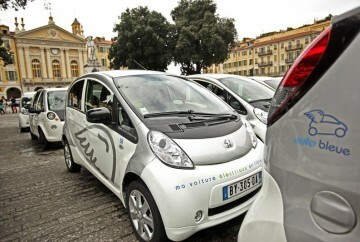 - From City Center (Train station / Nice-Ville) to the Airport (Terminals 1 and 2) by the Promenade des Anglais. 2 terminals for departures daily, every 30 minutes, between 8:00am and 9:00pm. In order to travel bus routes 98 and 99 with express service to and from the airport, you will need to purchase a «Aero Pass» available directly from the bus driver or in any « Lignes d'Azur » kiosk (6 €). This pass includes travel on the network for 74 mn. The Nice Acropolis Convention Centre is located 7km from the Nice Côte d'Azur Airport and 5 'terminus of the line 98 "Art Walk". • Title "Solo": it allows you to make a trip with correspondence during 74 minutes on buses and trams throughout the metropolis. It is sold € 1.50 on the bus or in vending machines tram stations. • Title "Multi 10 journeys": it allows you to make 10 trips with correspondence during 74 minutes on buses and trams throughout the metropolis. Available for 10 € in vending machines tram stations and in stores "Lignes d'Azur". This title can be used simultaneously by multiple travelers. • Title "Pass one day": 24 valid from the first validation on the bus or tram. The use of direct lines to the airport (lines 98 and 99) is not permitted with this title for a specific title "aero" has been created for these two lines. Sold € 5 on the bus or in vending machines and tram stations at points of sales Azur Lines. For comfort and efficiency, Nice has chosen the tram. 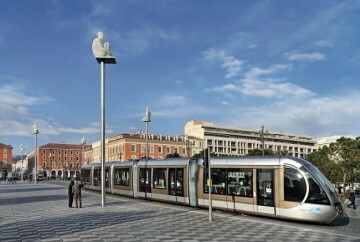 This new-generation mode of transportation with dedicated right-of-way covers 9,150 km and 22 stops and connects the North and the East via the city centre through Avenue Jean Médecin and Place Masséna. How to reach your stations "Congress"? To go to the Acropolis Congress stops "Acropolis" or "Art Walk". To go to the Acropolis exhibitions: the "Palais des Expositions". Namely: There are no sales onboard the tram tickets. Do not forget to validate your title when boarding. Get around the city in a different way with Vélo Bleu! 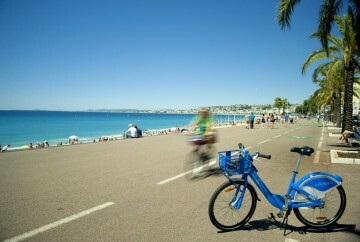 Nice also offers an alternative means of transportation with easy-hire cycles. 175 docking stations distributed across the whole network (one docking station every 300 metres) give you access to 1 750 cycles, 24/7, 365 days a year. Useful information: How to use your Vélo Bleu ? 57 Renaut Zoé Life R90 are available for self-service rental in Nice, Saint-Laurent du Var, Cagnes-sur-Mer and Villefranche-sur-Mer. The interurban bus network, particularly dense in Nice, operates along regular service routes in all city neighbourhoods. To fully complement its transportation network, Nice also offers taxi services, available day and night. Reservations, account openings, taxi vouchers. Any trip distance. Consider asking a transport conference pass to the organizer of your congress!